COLLAPSE: CLIMATE, CITIES & CULTURE focuses on the design community’s response to environmental urgency, using architectural models, design prototypes, drawings, and videos to frame and advance this vitally important conversation. COLLAPSE is not a dystopian future-scape, but is in fact our “right now.” The Directors of Global Design NYU believe that designers must join or initiate interdisciplinary efforts to find solutions for our current state of planetary peril. COLLAPSE estimates that one species goes extinct every seven minutes and this rate may be up to 1000 times faster than evolutionary norms. In our exhibit design, the empty cages represent loss, or voids, in our natural world. They are like coffins for species whose graves we will never know, whose lives we will never learn about. The exhibit design also features over a ton and a half of e-waste, lent to us by environmental waste management company. E-waste (products with batteries or cords) contain poisonous heavy metals, chemical flame retardants, and polychlorinated biphenyls (PCBs). As our world becomes more interconnected, our production of e-waste is skyrocketing. Interconnectivity may save the planet in some ways, but its harm is already evident. The practices and projects selected for this exhibition come from a myriad of disciplines and operate at multiple scales, in a range of forms—constructed works, materials and systems research, community development, speculation, and philosophy. These diverse projects are joined by their shared focus on improving the health and well-being of our fragile planet and all of its occupants. Design will help to determine how we face our current and future collapse. Global Design NYU, Collapse: Climate, Cities & Culture, directed and curated by Peder Anker, Louise Harpman, Mitchell Joachim, The Gallatin Galleries NYC, June 12-29, 2018. Peder Anker and Mitchell Joachim (eds.) School of the Earth: Gallatin Reimagined in 2061, (New York: Gallatin School, 2017). School of the Earth is a vision for what the Gallatin School of Individualized Study at New York University should be like in 2061 at Albert Gallatin’s 300th birthday. The envisioned new school is designed with our planet in mind. It is a school designed to fit the local ecosystem. This book was born from a dedicated class of students lead by professors Peder Anker and Mitchell Joachim. Humans have done enough taking, the students argue, and it is time to start giving back. Giving back to our planet and each other. The world is more connected than ever before and it is only going to become increasingly more intertwined and complicated. School of the Earth is about the necessity of connection, not only from human to human but between nature and people as well. The new vision for the Gallatin School is complete with visionary images and a model created to educate students and the public that not only is it possible for humans to exist while giving back, but that we can help make the planet a better, healthier place for the future as well. The book, the exhibition, the model, a film, a published manifesto in Confluence, and the web site were the final results made by students of the class “Designing for New Climates: Histories of Adaptation” co-taught with Mitchell Joachim. TechStyles: The Gallatin Fashion Show will offer an examination of how fashion is inspired by science and technology, with sixteen collections from Gallatin students and alumni. TechStyles: The Gallatin Fashion Show will feature looks that take some heat from Steampunk, find God in the machine, suit up for Utopia, as well as offering meditations on stardust and bioluminescence and other phenomenon of the natural world. Q&A: Colby Jordan and Peder Anker. Mar. 3 | 7:00 – 9:00 PM | The Jerry H. Labowitz Theatre for the Performing Arts | Gallatin School of Individualized Study, 1 Washington Place, New York. ENVISION: Nature and Design, sponsored by Global Design NYU, creates an exciting dialogue with many disparate and active researchers within the Gallatin community, as we look to broaden the horizons on the meanings of Nature and Design. The event is a structured presentation format where presenters show 20 images, each for 20 seconds. The images advance automatically to coordinate with the speaker, creating a fast-paced and lively environment for showcasing current work. Powered by PechaKucha. With Jack Richards, Jack Tchen, Katherine O’Kelly, Carly A Krakow, Matt Stanley, Marie Cruz Soto, Lauren M Walsh, Anooradha Iyer Siddiqi, Fran White, Leila Buck, Judith Sloan, Piper Anderson, Frederic Clark, Carter Bird, and Karen Holmberg. Organized by Peder Anker, Mitchell Joachim and Louise Harpman. 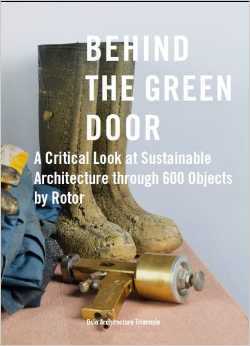 “Comments” in Behind the Green Door: A Critical Look at Sustainable Architecture through 600 Objects by Rotor, (Oslo: Oslo Architecture Triennale, 2014), 27, 169, 178, 203, 210, 214. Behind the Green Door: A Critical Look at Sustainable Architecture through 600 Objects portrays the prevailing green wave in architecture and the many controversies that surround it. The book is enriched with comments from over 100 international experts. Architects, sociologists and environmentalists explore the intersection between design and the social sciences at large by explicating the concept of “city” and “citizen” in parallel. Cities and Citizenship is a three-day symposium, consisting of a conference series and workshops, that explores how the design of cities can promote a more engaged citizenry. The event will engage leading designers, architects, landscape architects, planners, urbanists, historians, and scientists. 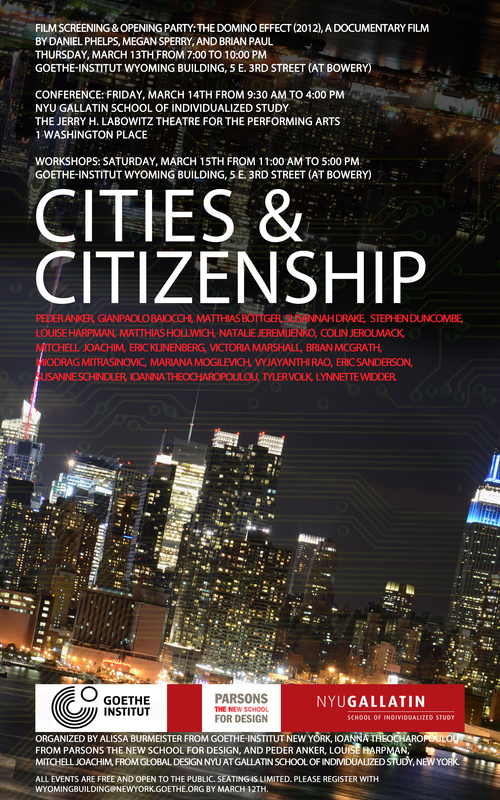 Cities and Citizenship is co-sponsored by the Goethe-Institut New York, Parsons The New School for Design, NYU Gallatin School of Individualized Study and Global Design NYU. The symposium is organized by Alissa Burmeister from the Goethe-Institut New York, Ioanna Theocharopoulou from Parsons The New School for Design, Peder Anker, Louise Harpman, Mitchell Joachim, from Global Design NYU at Gallatin School of Individualized Study, New York University, and is part of the Goethe-Institut’s international Weltstadt: Who Creates the City? initiative. MARCH 13-15, 2014. DOWNLOAD PROGRAM. All events are free and open to the public. Seating is limited. Please register with wyomingbuilding@newyork.goethe.org by March 12th. Participants include: Peder Anker, [History of Science, Gallatin School, NYU], Gianpaolo Baiocchi [Sociology, Director of Civic Engagement, Gallatin School, NYU], Matthias Böttger [Architect + Curator, Raumtaktik, Berlin], Susannah Drake [Landscape Architect, dlandstudio], Stephen Duncombe [Sociology, Gallatin School, NYU], Louise Harpman [Architecture, Gallatin School, NYU], Matthias Hollwich [Architect + Co-founder, HWKN], Natalie Jeremijenko [Fine Art + Environmental Studies, NYU], Colin Jerolmack [Environmental Studies + Sociology, NYU], Mitchell Joachim [Architecture, Gallatin School, NYU], Eric Klinenberg [Sociology, NYU], Victoria Marshall [Landscape + Urban Designer, Parsons], Brian McGrath [Architecture, Dean, School of Constructed Environments Parsons], Miodrag Mitrasinovic [Architecture + Urbanism, New School], Mariana Mogilevich [Architecture + Metropolitan Studies, NYU], Vyjayanthi Rao [Anthropology, New School], Eric Sanderson [Senior Conservation Ecologist at WCS], Saskia Sassen [Sociology, Columbia University], Susanne Schindler [Architecture, New School, Candide Journal], Ioanna Theocharopoulou [Architectural History, Parsons], Tyler Volk [Biology + Environmental Studies, NYU], Lynnette Widder [Earth Institute, Columbia University]. Review: Carly Krakow, Peder Anker, Louise Harpman, Mitchell Jocahim, “Cities and Citizenship: Notes from the Conference,” Weltstadt Zeitung, no. 5, April 30, 2014, 3.